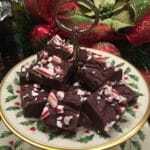 Sweeten up your holidays this year with my rich, creamy and decadent Easy Chocolate Fudge recipe! Packaged in a Christmas tin, Easy Chocolate Fudge makes a wonderful homemade Christmas gift for those chocoholic foodies in your life and it is also is a perfect hostess gift. During the holidays it is a tradition in many homes to have sweets on hand for guests. 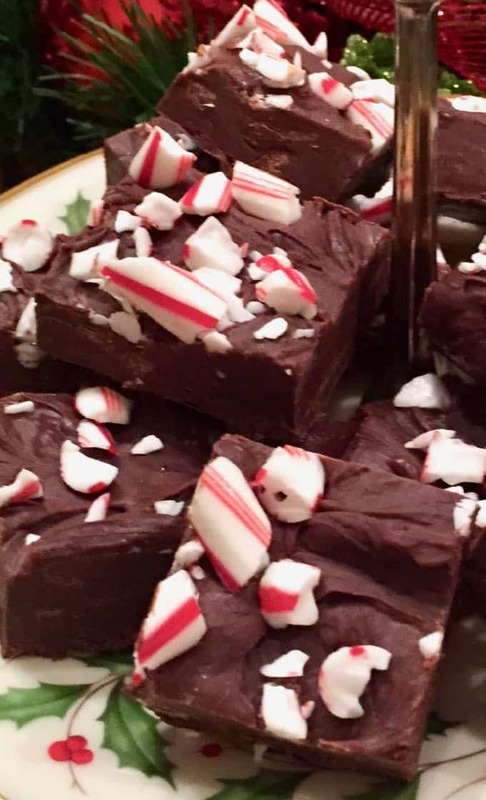 And, this quick and easy 3-ingredient chocolate fudge made with sweetened condensed milk is perfect because it can be made in minutes and it looks very festive with the crushed red and white candy on top. 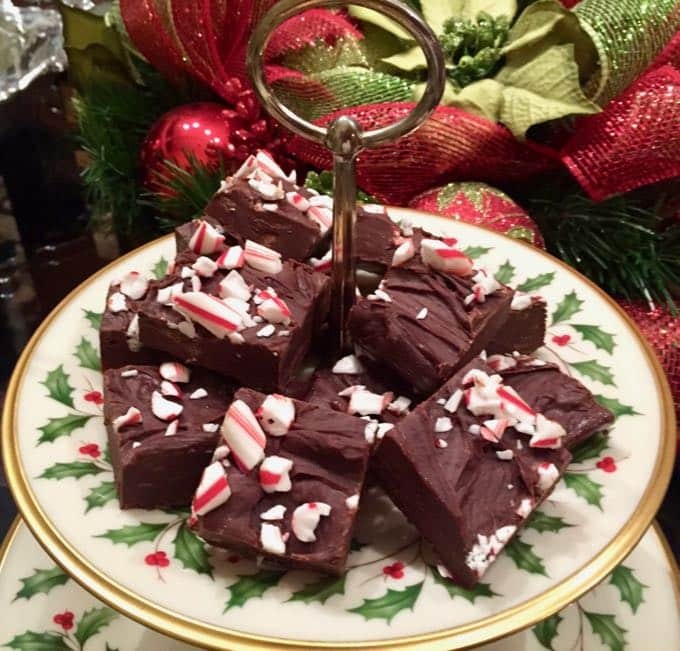 I always have fond memories of my Mom making chocolate and peanut butter fudge at Christmas. Only she made the real thing and spent countless hours making the most incredible fudge ever. Of course, with 6 children, none of it lasted very long in our house. Normally, we weren’t even allowed to have sweets, so fudge was always an extra special treat. This simple fudge recipe is a far cry from the old-fashioned fudge recipes of yesteryear and only takes a few minutes to prepare. 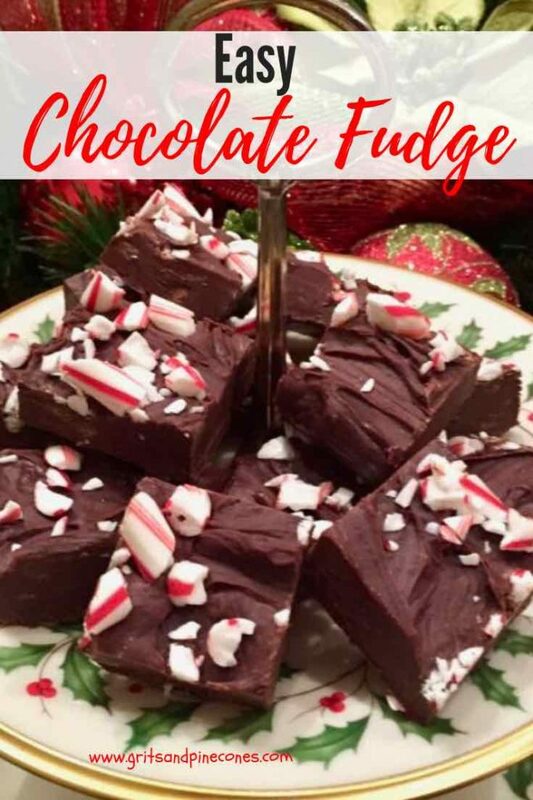 This fudge recipe also only calls for 3 ingredients which are: semi-sweet chocolate chips, sweetened condensed milk, and peppermint candies or crushed candy canes. How easy is that? If you like to make homemade sweets as gifts during the Christmas season, you might also like these popular recipes on my blog: Dark Chocolate Billionaires Candy, Caramel Corn with Chocolate Drizzle, and White Chocolate Bark with Pistachios and Cranberries. To begin, line an 8-inch square pan or dish with aluminum foil and spray the surface of the foil with non-stick cooking spray. 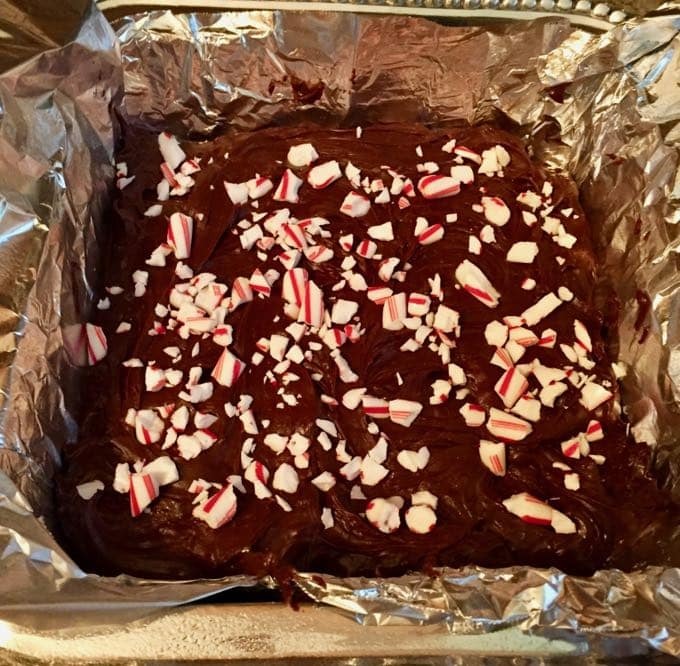 Be sure you have enough foil to use as handles sticking up on each side to lift the fudge out. Combine the chocolate chips and sweetened condensed milk in the top of a double boiler over medium heat. Stir until melted, which should take about 7 minutes or so. Just as soon as the mixture is smooth and creamy, pour into the pan you prepared, smooth the top and sprinkle with crushed peppermint candies. Lightly press the crushed candies in. Refrigerate for 2 hours, then remove the fudge from the pan using the aluminum foil to lift it out. Cut into squares and enjoy! For the best texture, be sure to slowly melt the chocolate into the mixture using a double boiler or glass bowl over a small pot of simmering water. Heating the chocolate too fast will result in grainy fudge. Alternatively, you can also microwave the mixture in 30-second increments, on medium heat until the chocolate chips are melted. *This recipe was originally published December 5, 2015. Republished November 24, 2018, to simplify directions and update photos. No change to the original recipe. Line an 8 inch square pan with aluminum foil and lightly spay with cooking spray or grease with butter. 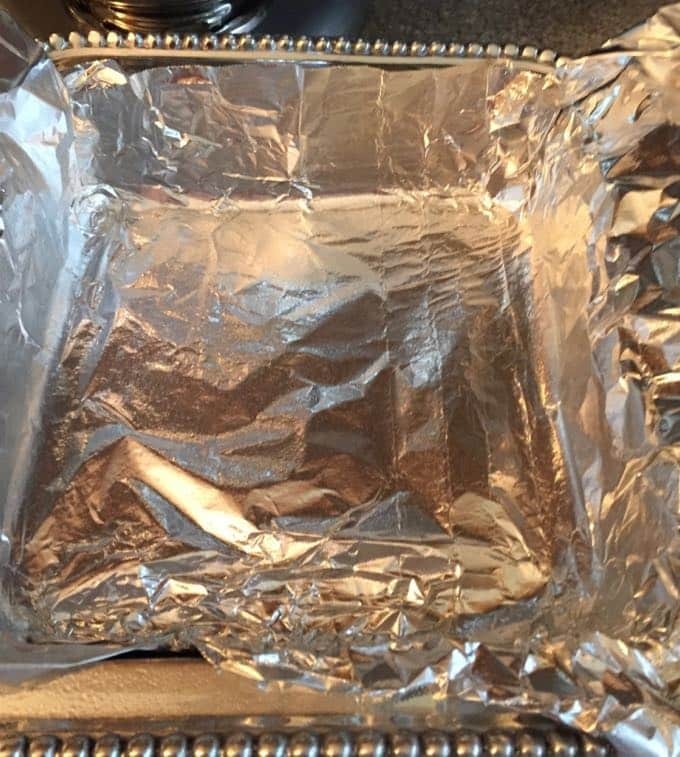 Make sure you leave enough foil on each side to life the fudge out when cool. 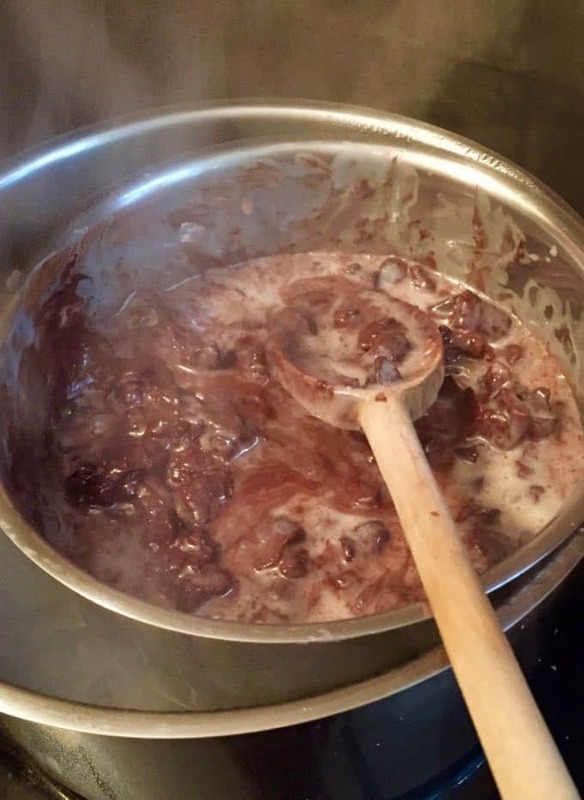 In the top of a double-boiler over medium heat heat up the chocolate chips and sweetened condensed milk. Stir until melted and creamy which should take about 7 minutes or so. Immediately pour chocolate mixture into your prepared pan and smooth out the top. Sprinkle with crushed peppermint candies and lightly press in. Cool in the refrigerator for about 2 hours and remove from pan using your foil handles. Cut into squares and enjoy!